In my opinion breakfast food is the best type of food. 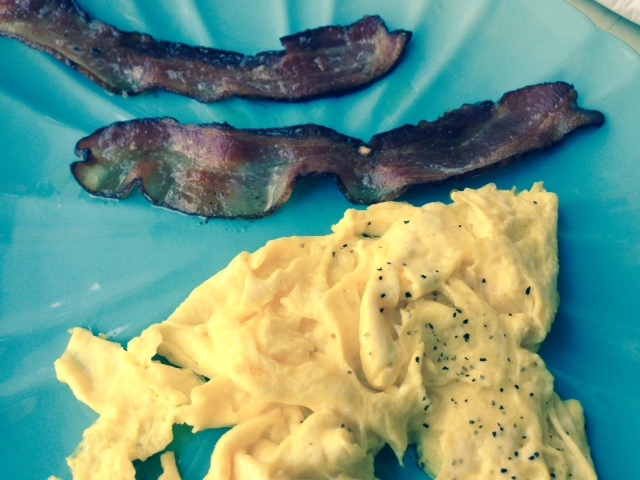 I have never been and will never be the person who “just doesn’t eat breakfast.” On busy mornings I still make time for oatmeal and a banana, but I love all types of breakfast options – eggs, toast, bacon, pancakes! And because I love breakfast food so much I love brunch and breakfast for dinner! I know I’m not alone in my love for breakfast food, which is why I was always a little disappointed by the breakfast offerings downtown. 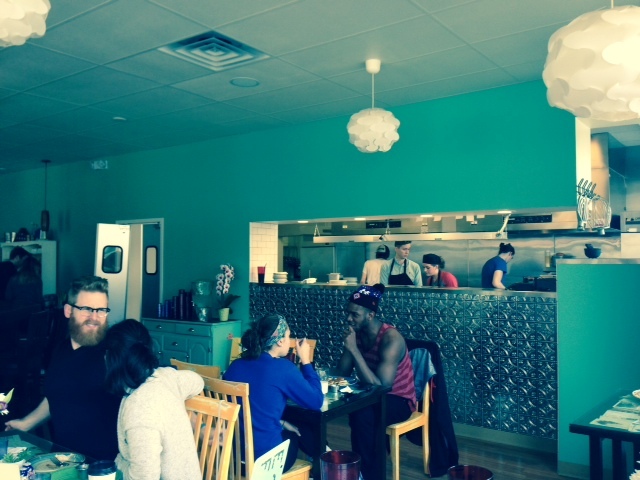 Recently, the Bassett Street Brunch Club opened, but there aren’t other places that serve breakfast all day downtown. So when I heard that the Short Stack Eatery opened right in the middle of State Street and would be serving breakfast all day, every day I thought I’d love it. Well I love the theory, but the execution didn’t work for me. Short Stack Eatery is in a corner building so it has a ton of windows and is super bright and cheery. 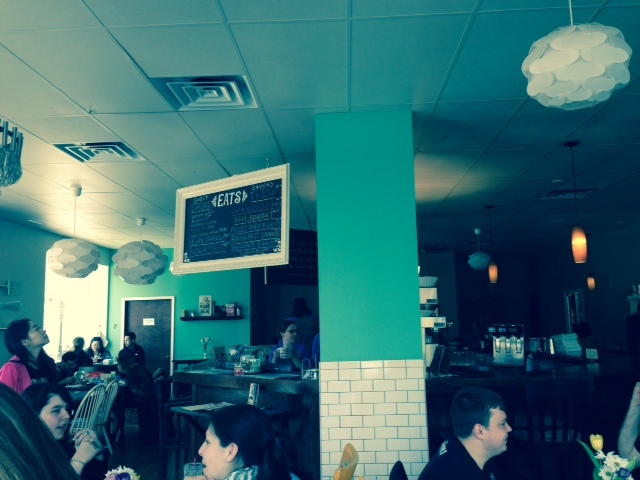 The brightly colored teal walls also add to the cheeriness. 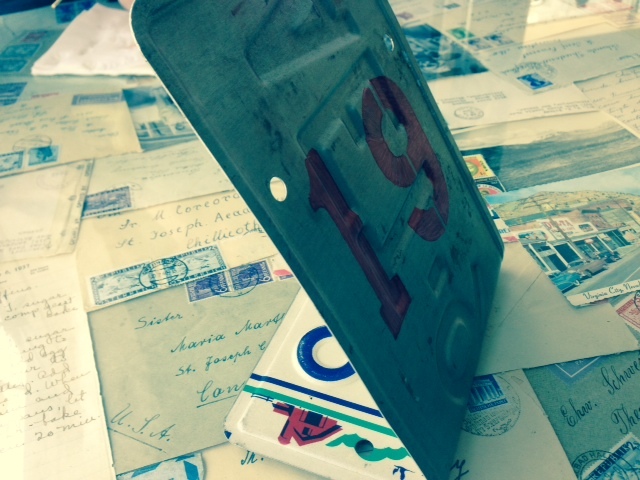 Table numbers are made with old license plates and tables are littered with old letters, maps and clippings, which is a cute way to bring in some nostalgia and Wisconsin pride. There’s a big counter in the middle that serves as a place for staff to huddle and diners to sit around. 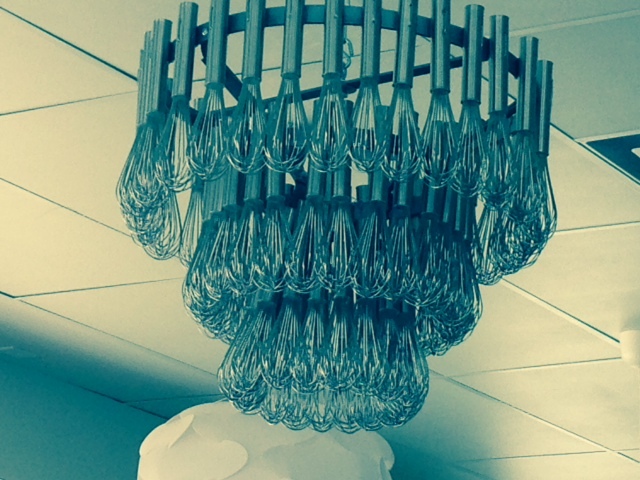 The huge chandelier made of whisks was my favorite! We went on a busy Saturday morning after the farmer’s market and actually got a table right away, but only after we ordered at the counter. That was strike number one – I don’t like having to order and pay at a counter and then fight for a table while waiting for my food. Ordering at a counter also means we had to brave the busy drink station to get our own waters, silverware and even build a bloody Mary. I realize this makes me sound lazy, but the space Short Stack Eatery is in is way too small to make diners conglomerate around a small table for their drinks and utensils. Their menu has all of the usual breakfast suspects: eggs, pancakes, french toast, etc. But then it has two unconventional options. A Pick Three option, which is exactly what it sounds like – they have a list of options and you get to pick three. The other one is a blind special, which again is exactly what it sounds like…but if you want to know what’s in it you get charged $12.95 and if you order it in blind faith it only costs $6.95, which in theory sounds good but you really have to be open for anything. The next strike against the Short Stack Eatery was the prices. A glass of orange juice is $4.25 – it is fresh-squeezed, but holy crap that is an expensive glass of orange juice. My meal was $8.95, which isn’t bad for breakfast, but the portions were just so freaking small it wasn’t a good deal. So my $8.95 meal was the Pick Three option on the menu. I chose bacon, scrambled eggs and pancakes from a list that also had breakfast potatoes, toast and a couple other things. I was shocked when my order came out. 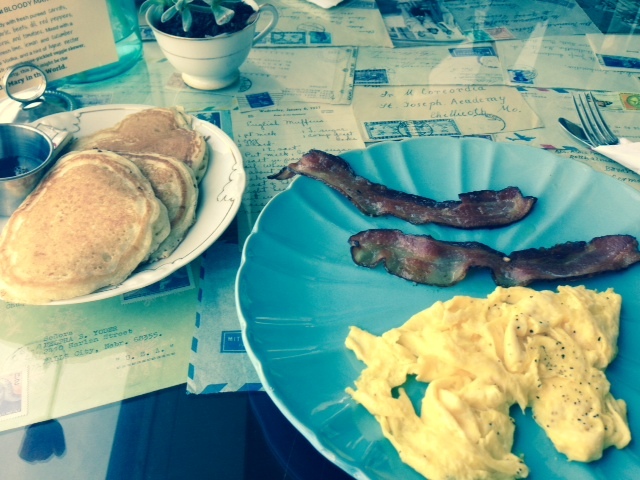 The two eggs barely seemed like one large egg, the two small pieces of bacon were laughable and the three pancakes were about the size of a coffee mug. Everything was good – the bacon was cooked just right, the eggs were fine and the pancakes were actually pretty good, but almost $10 for a couple bites of egg, two pieces of bacon and three small pancakes? I was very disappointed in the price for what I ended up getting. And even though their orange juice was fancy and fresh squeeze, nothing on my plate warranted the price tag. 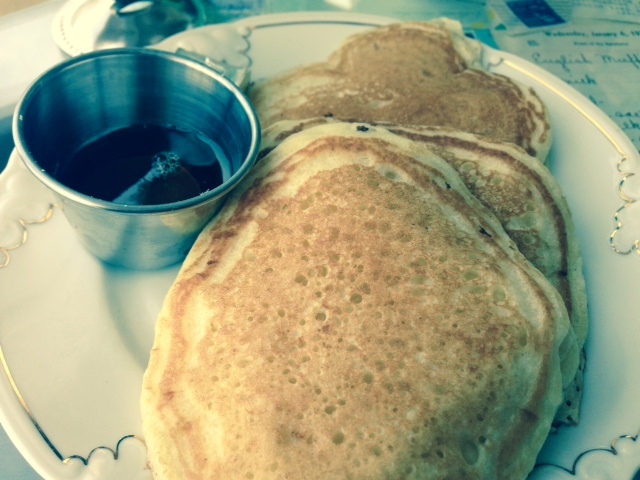 FOOD NOTES: I really wanted to be excited about a fun new breakfast place downtown, but unless Short Stack Eatery drops their prices or increases their portion sizes I won’t be back. I was shocked with the small amount of food I got, but the food I did actually get served was decent. Unfortunately, because people who live downtown like trendy places like Short Stack Eatery they probably won’t be changing their prices or portion sizes anytime soon, and will probably be pretty successful. The decor was cute, but I really don’t like having to order at a counter and fight for a glass of water and a napkin at a drink station.